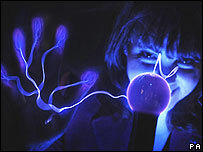 Science education centres around the UK face serious financial threats and some have already closed, MPs have warned. The science and technology select committee wants the government to give centres at risk short-term funding. Two of the centres which were funded by the Millennium Commission - Doncaster's Earth Centre and Ayrshire's Big Idea - have already closed, its report says. The loss of such centres is a threat to science education, it says. Ministers say they will respond "in due course". The report, the Funding of Science and Discovery Centres, says that these centres make a valuable contribution to the public's engagement with science - but there are serious financial problems. After initial funding, these centres are unable to pay for themselves - and the report says that without a change in their financial support, they will be closed before their value has been properly assessed. The Earth Centre and Big Idea have both closed and another, At-Bristol, has had to close two of its three attractions and has made 45 staff redundant. The report says the government should not be obliged to fund loss-making centres on a regular basis, but as a short-term measure it should make cash available. It also recommends that "steps are taken to reduce the tax burden on science and other educational centres". The report says that the science centre concept has been around for about 20 years - representing a place for people to explore science often in an interactive setting. The biggest injection of funding came in the form of £450m for 18 centres from the Millennium Commission. 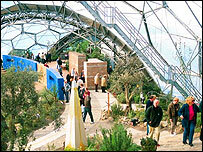 But the report says that in terms of earning revenue, science centres - apart from examples such as the Eden Project in Cornwall - have struggled to raise more than 80% of their running costs. This leaves them with a recurrent funding problem, says the MPs' report, which proposes they should be given a reduced rate of VAT - and it urges the government to consider supporting science centres in the way it subsidises museums. A Department for Innovation, Universities and Science spokesman said that the government is "keen to encourage young people and the broader community to get involved with science". He said they would respond to the report more fully "in due course".